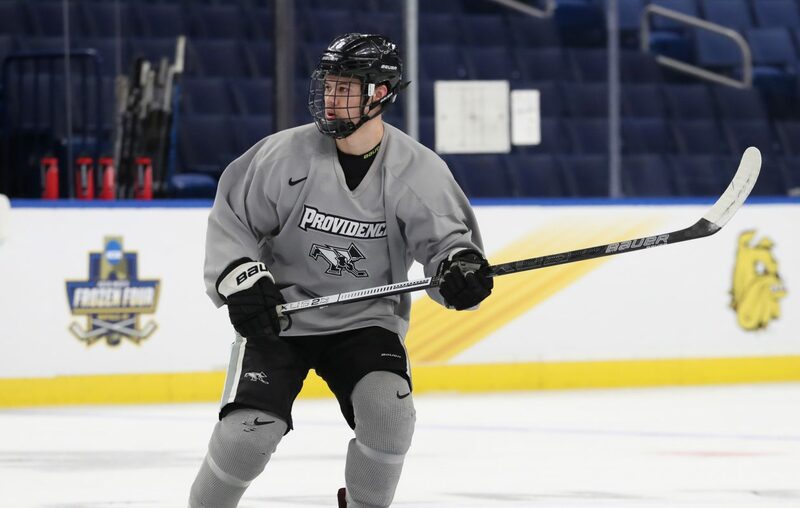 Fresh off an appearance in Buffalo in the Frozen Four, Providence College defenseman Jacob Bryson has signed a three-year entry level contract with the Sabres. Bryson will sign an amateur tryout contract and report to the Rochester Americans, who begin preparations Wednesday for the first round of the American Hockey League playoffs. Game 1 against Toronto is Friday night. Bryson's entry-level deal will start with next season. Bryson, a Sabres' fourth-round pick in 2017, had four goals and 24 assists for 28 points in 42 games and was Providence's team captain this past season. His assist and point totals were career highs. He finished his Friars' career with 73 points (11 goals and 62 assists) in 121 games. During the Frozen Four, Bryson said he remains in regular contact with the Sabres’ development staff. “They give me things that they want me to do every game,” Bryson said, “and I think it’s my job to kind of get to those expectations every game, because you don’t want to have one good game, one bad game. You want to play every game at your best. I try to reach those expectations of what they give me, just little tips here and there. I get tips from [Providence] Coach [Nate] Leaman and I get tips from them, too, so I kind of get the best of both worlds and that’s what makes the best players.